40 years ago many of us considered to have disabilities lived a life of relative isolation. There were few ways to participate in the life of our communities. In most every aspect of life be it education, healthcare, or employment, citizens with disabilities lacked sufficient support to lead a meaningful life and to contribute to their community. Thankfully much has changed for the better, but what happens when those of us considered to have disabilities reach retirement age, are between jobs or may require a level of personalized support which hinders employment? The Day Service Program is a daily program which provides a variety of supports to more than thirty adult participants who are seeking employment or are between jobs. Our “CA” program is designed to support those who may require more personalized support due to physical or cognitive disabilities. 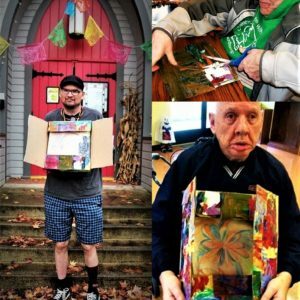 Cornerstone’s Community Access Day Service Program provides a variety of supports and activities including community outings, arts and crafts classes, exercise classes, and job training all of which lead to the development of basic social, physical, and work skills. Those involved in our program have participated in community art exhibits, poetry readings, gardening and much more. We believe that our entire community benefits when we are all a part of it. Our Cornerstone Gardens program, located in an abundant pastoral setting near Philomath, encourages Associates to connect with nature and to create significant social bonds through gardening and cultural activities. In addition to crafts, exercise, and a wide variety of community outings, we are planning to create a gardening component in which every participant will have the opportunity to design their own micro garden unit. This quiet, lush country setting allows Associates to connect to nature, and to create significant social bonds through gardening and cultural activities.